A redwood spider on redwood bark, its body about an inch long. 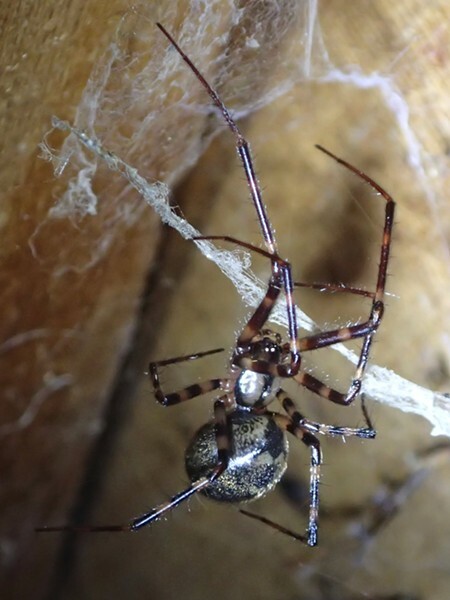 The redwood spider is one of the “hackelmesh spiders,” or lace weavers, known to make lacy webs. At least one related species is notable in that the female cares for her young up until they eat her. True to their name, I often find redwood spiders on my redwood trees, hiding in short silk-lined tunnels in the furrows of the bark. Although I have yet to see what they eat, they evidently make a good enough living there to perpetuate the species. They are tidy housekeepers, not leaving old insect carcasses laying about. 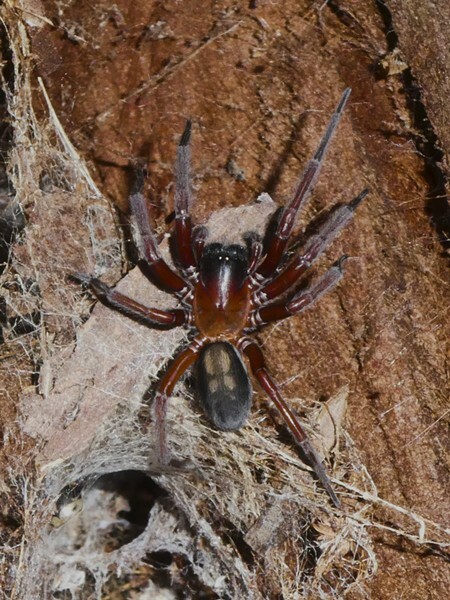 They also seem to like my well house, along with another kind of large spider with long, thin, banded legs. According to BugGuide.net, these are of the genus Pimoa. Their webs are made of very fine fibers woven in sheets, like a hammock. A male pimoa with a leg span of about 1.25 inches. A female pimoa. Note her large abdomen for making babies. Her leg span is about 1.5 inches. 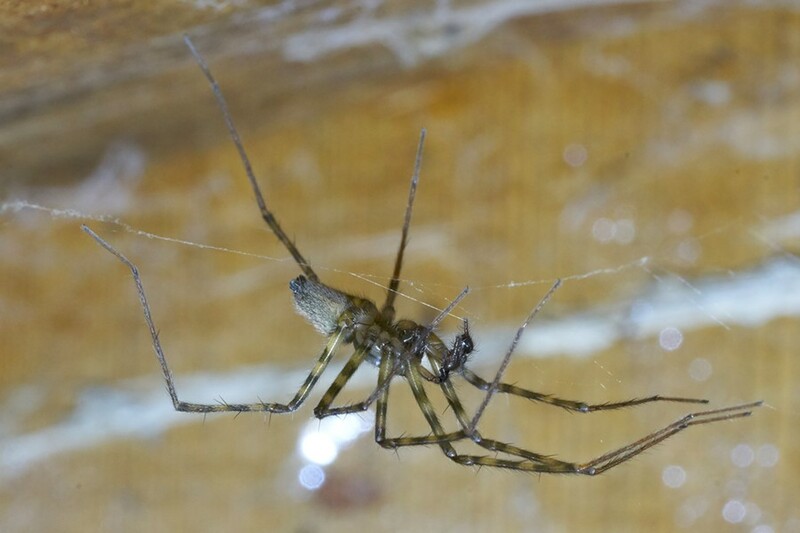 Protecting the inside of my garage is a different critter altogether, the cellar spider (genus Pholcidae), which may be another import. This family is notable for extremely long slender legs and the habit of vibrating their bodies vigorously in their webs when threatened. They are sometimes called daddy long legs spiders, causing a bit of confusion since both harvestmen (Opliones) and crane flies, members of the insect family Tipulidae, are often called by that name. 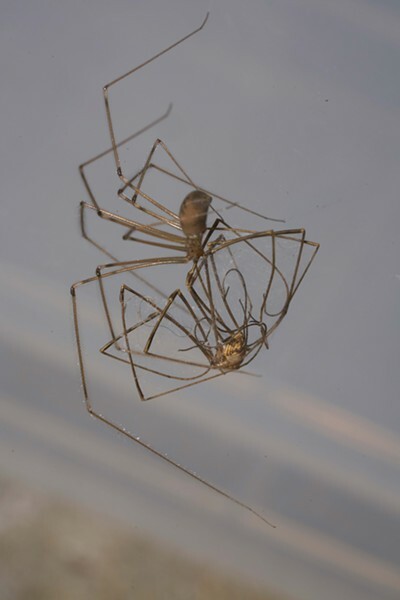 A cellar spider captures a harvestman, making for a confusing tangle of legs and names. So, I'll call them cellar spiders, daddy long legs, and crane flies, or, respectively: Pholcidae, Opiliones and Tipulidae. (Yay for Latin names!) These are truly creatures of the dark, coming out to play when the sun goes down. Happy Halloween! 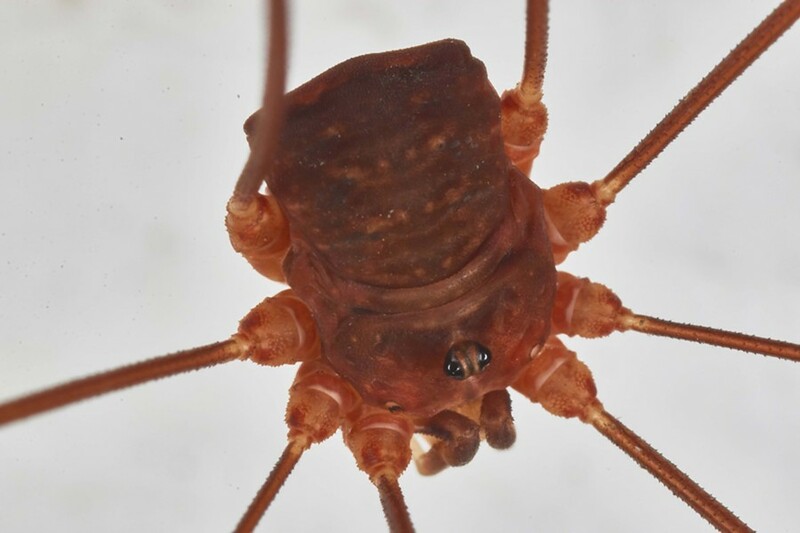 A close-up of a Harvestman shows two eyes positioned like a turret. Spiders have either six or eight eyes.